U3O8 Corp.’s top priority uranium-vanadium deposit. Preliminary Economic Assessment shows that uranium would be produced at a cash cost of US$22 per pound of uranium – one of the lower-cost potential producers in the uranium industry – in a jurisdiction that needs local uranium production. Project is 100%-owned by U3O8 Corp. Uranium and vanadium are concentrated in a one-metre thick layer that extends from surface to a maximum of three metres depth in unconsolidated gravel. Mining of the gravel would be by continuous miner – equipment that’s similar to machinery used to lift old asphalt in the resurfacing of paved roads. Mining would not involve the use of explosives nor would processing require crushing of the gravel. A “migrating trench” method would be used to mine the gravel: continuous miners would make a long, narrow cut in the soft gravel and remove material from the leading edge of the trench, resulting in the edge of the trench crabbing sideways across the gravel plain. Uranium-vanadium – bearing gravel would be lifted by conveyor belt from the continuous miner onto trucks and transported a short distance to a semi-mobile screening unit for washing and sieving to separate the barren pebbles and coarse sand from the fine-grained component in which the majority of the uranium-vanadium is concentrated. Pebbles and coarse sand removed by the screening process would be replaced on the trailing edge of the trench along with any barren gravel that needed to be removed to expose the uranium-bearing layer on the leading edge of the trench. Vegetation (mainly desert shrubs) removed from the leading edge of the trench immediately prior to mining would be transplanted in the gravel that had just been replaced on the back side of the trench. At the end of the mine life, the trench would be filled for the last time and restored with indigenous shrubs and there should be very little evidence that the area had been mined. The fact that the uranium is concentrated in the very fine-grained component between the barren pebbles and coarse sand of the gravel, makes this extremely low-grade deposit economically attractive. In the Guanaco sector of the deposit, which contains 88% of the Laguna Salada resource, 85% of the gravel’s uranium is contained in the fine-grained component that constitutes only 8% of the gravel’s mass, resulting in a twelve times increase in grade (1). 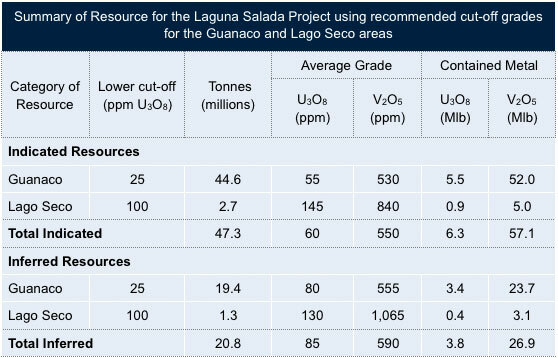 In the Lago Seco sector, which contains the remaining 12% of Laguna Salada’s resource, 74% of the gravel’s uranium is concentrated into the fine-grained component that constitutes 11% of the gravel by weight, resulting in a seven times increase in grade into the fine-grained material. Beneficiation of the gravel by washing and screening (sieving) would result in the grade of the slurry that reaches the processing plant having a similar head-grade to other operations of this type, such as the Langer Heinrich Mine in Namibia(2). The fine-grained component of the gravel separated from the pebbles and coarse sand in the screening process would be mixed with water to form a slurry that would be pumped to a central processing facility. Baking soda and washing soda would be added to the slurry and would be heated to a temperature of 80°C for four hours to maximize extraction of the uranium and vanadium. Uranium would be precipitated as sodium diuranate and heated (calcined) to form yellowcake (which is typically >70% U3O8). Vanadium would be precipitated as ammonium metavanadate and would be calcined to produce vanadium pentoxide (V2O5). Yellowcake and vanadium pentoxide would be the final products produced at the mine-site mill. Tailings, the fine-grained material from which the majority of the uranium and vanadium had been extracted, would be pumped to a tailings facility constructed from compacted gravel lined with compacted clay on impermeable shale. The cash-cost of production, which includes a 3% net smelter royalty payable to the State, was estimated at US$21.62 per pound of uranium (U3O8) net of a vanadium by-product credit. The flat-lying, near-surface nature of the uranium-bearing gravel layer provides the operator with the option of mining the highest-grade area of the deposit first in order to pay back the capital loaned for the construction of the project. If this approach were taken, the capital cost of the project could be repaid in 2½ years at an average cash-cost of production of US$16.14 per pound of uranium. Laguna Salada is, to the knowledge of the Company, the only uranium deposit in Argentina to have a resource estimated, and Preliminary Economic Assessment conducted, in accordance with NI 43-101 guidelines. The Preliminary Economic Assessment established an average annual production of 0.6 million pounds of uranium (U3O8) and 1 million pounds of vanadium (V2O5). Argentina’s requirement for fuel for its reactors is 0.4 million pounds of uranium per year. The Cerro Solo Deposit, located 150 km north of Laguna Salada in Chubut province, is reported to contain an estimated 24 million pounds of uranium at a grade of 0.24% U3O8(5). The deposit belongs to the State and the resource estimate was made by the Argentine Nuclear Authority (CNEA or Comision Nacional de Energia Atomica). To the Company’s knowledge, no formal economic study has yet been undertaken on the Cerro Solo Deposit. 1. See the September 18, 2014 technical report: “Preliminary Economic Assessment of the Laguna Salada Uranium Vanadium Deposit, Chubut Province, Argentina.” The PEA is preliminary in nature and includes inferred mineral resources that are not mineral reserves and do not have demonstrated economic viability. There is no certainty that the PEA will be realized. (see Disclaimer). 2. Similar deposits elsewhere in the world such as Langer Heinrich typically have a mill feed grade of 550-600ppm after beneficiation. These deposits have not been verified by U3O8 Corp. and information regarding these deposits is drawn from publicly available information. 4. Based on exploration results of other mineralized areas within the Laguna Salada district, there is a conceptual uranium target of 75-120 million tonnes at 50ppm to 60ppm U3O8 (10-15Mlb) identified in the district outside of the current resource area. Potential quantity and grades are conceptual in nature. There has been insufficient exploration to define a mineral resource north of the current resource. It is uncertain if further exploration will result in additional mineral resources being delineated in the region. 5. Lopez, L., 2013. Uranium deposits and resources in Argentina in the framework of the UDEPO classification 2013. IAEA Technical Meeting on Classification of World Uranium Deposits with Focus on Volcanic-related Deposits.